If you’ve decided to disbud your goats, you have to decide whether to use a veterinarian, have an experienced goat friend disbud, or do it yourself. Unless you disbud kids under anesthesia, a kid holding box is essential. 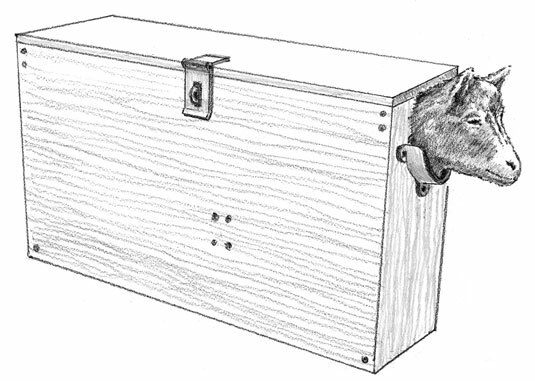 This rectangular hinged box exposes just the goat’s head, enabling you to disbud and tattoo without having to hold a struggling body. A syringe with 1 cc of tetanus antitoxin, which you can get at a feed store. This will protect the kid from tetanus for 10–14 days. Pain reliever and anti-inflammatory Banamine, which you get from my vet. Aspirin or ibuprofen also do the trick, but you need to give them with food. A debudding iron burns the horn bud, causing it to eventually fall off. Give the kid the tetanus shot and the pain reliever. The pain reliever takes about a half-hour to work. Heat it until the end is red hot — about 20 minutes. 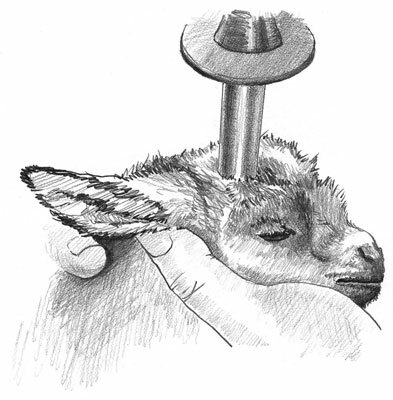 Position the kid in a kid holding box so that the ear nearest the horn bud you start with is tucked back into the kid box. You also can recruit someone to hold the kid while you disbud. If you go that route, make sure that person is wearing heavy gloves and a long-sleeved shirt so that she doesn’t get burned when the kid struggles. Clip the horn area with your clippers to expose the horn bud. Clipping the hair keeps it from burning and smoke going into your eyes as you disbud. Firmly grasp the goat’s muzzle, making sure it can breathe, and evenly apply the disbudding iron to the horn bud. Hold the iron on the bud while applying firm pressure and gently rocking the iron for eight seconds, keeping the kid’s head immobilized. 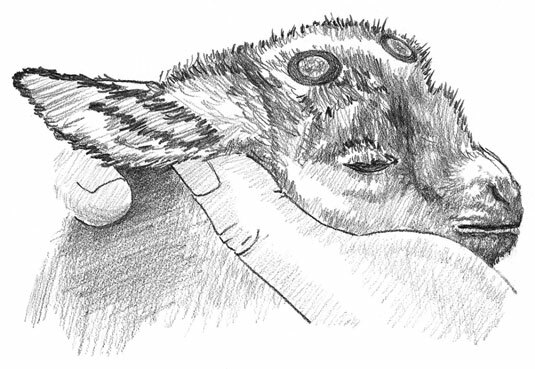 For older kids or bucks who have some horn growth, allow up to eight more seconds. The kid will struggle and yell, but the process is over very quickly. Check to make sure that you have left a dry-looking, copper ring around the horn bud. Remove the part of the bud inside the copper ring with your fingers. If it bleeds, you can cauterize it by applying the disbudding iron lightly. Repeat steps 3 through 7 with the other horn bud. Never use a disbudding paste on a goat. Because of their nature, goats will rub the caustic substance on each other, which can lead to chemical burns or even blindness. Remove the kid from the box and spray antiseptic spray on the disbudded area, taking care to avoid the eyes. When the process is over, give the kid its bottle or put it under its mother to nurse. Try not to let the doe smell the kid’s head or she may try to reject it.